Stunning images are the backbone of every great looking website. And unless you have access to a professional photographer, you need to rely on stock images. For years, the process of getting those beautiful images on a site has been less-than-ideal. Now, thanks to PageCloud’s new integration with Shutterstock, the process of searching, previewing, and purchasing high-quality images has never been easier. The seamless integration allows PageCloud customers to browse through over 200 million royalty-free images directly from within the PageCloud app. Best of all, before committing to a purchase, customers can leverage PageCloud’s revolutionary drag and drop functionality to position and style the watermarked images to ensure they fit the website’s design. It’s important to note that PageCloud’s unique ability to edit and save watermarked images is not offered by other website building platforms. Once an image is purchased at the discounted rate of $5, PageCloud automatically replaces the watermarked version with the high-resolution image. To maximize efficiency, PageCloud maintains the exact position and styling of the image while automatically optimizing the size, enabling the image to load fast on every device and improve the customer’s website performance in search. This innovative process drastically reduces time wasted in downloading, resizing, styling, and replacing images within a site. Over the past few weeks, PageCloud has rolled out several image-related features including: improved image cropping, image filters, and color tinting. But it doesn’t end there; the PageCloud team is hard at work developing new and improved image sliders, gallery options and a completely redesigned user interface for managing images. These new features, combined with PageCloud’s partnership with Shutterstock, will give users an array of options when looking to build a custom website without code. 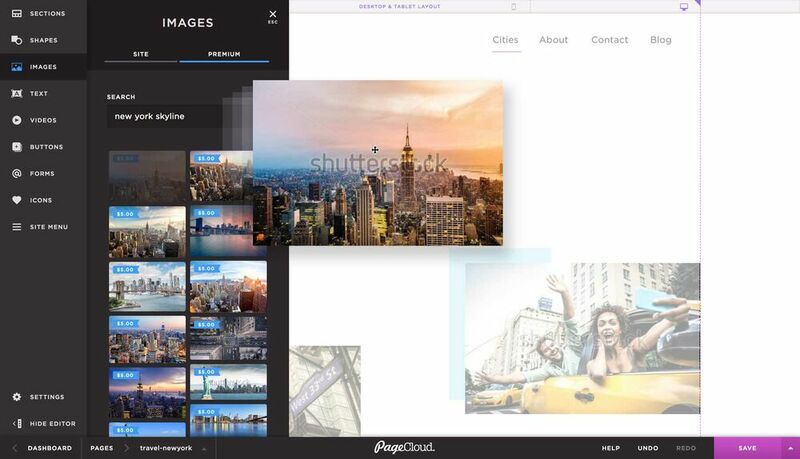 Want to try PageCloud’s integration with Shutterstock? Start your free trial today!